Review a Gaming DApp & Earn Rewards ft. State Of The DApps! Hello Everyone, we are here with another task for Crypto Gaming Enthusiasts and this time in association with State of the Dapps. All future tasks will be posted and promoted from @oracle-d.tasks. Do not forget to follow the account for future tasks where anyone can earn for creating content. Please read the guidelines and instructions carefully before your participation. Tag your Steem friends who might be interested in doing this one. Every blog that meets Oracle-D requirements will be rewarded with upvotes based at our own discretion. Top 5 content pieces will get full OD upvotes. Also, the liquid + SP rewards of this blog will be distributed among these top 5 folks. Share your STEEM blogs/vlogs on Twitter & Medium with hashtags mentioned in the task below, and drop the links in a single comment on this post by @oracle-d.tasks. Also, resteem this post now if you are planning to participate. State of the ÐApps is a curated directory of Decentralized Applications, also called ÐApps, on various blockchains. It was created to categorize and showcase developed projects built on the Ethereum Blockchain, more recently they have added support for POA, EOS and Steem. Review any Non-STEEM GAMING DApp from top 50 list on StateoftheDapps. Please note that it must be in game review using images, videos or by recording gameplay. Share your content on twitter & medium. Tag official twitter account of @Stateofthedapps (https://twitter.com/StateOfTheDApps) while posting your tweets and use SM Hashtags given below. Drop the links of your blog & tweets in a single comment on this post. Note: A single person is allowed to do reviews of multiple gaming DApps from Top 50 list. 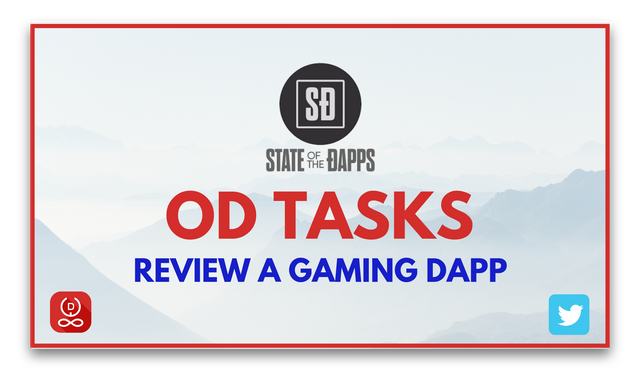 #StateoftheDapps, #DApp, #GameReview. Tag @stateofthedapps in all your tweets. Create one more hashtag on the basis of the name of the DApps you choose to review. For ex: If you are reviewing My Crypto Heroes then the hashtag would be #MyCryptoHeroes. State of the dapps, top crypto game dapps of 2019, Dapp review, Dapps, Blockchain and Cryptocurrency, Gaming, Crypto gaming, Gaming review, Crypto game review etc. Create only high-quality professional blogs, videos, images, graphics etc. The article must be at least 600-1000 words in length. Let me tag my friends that might be interested; @emma001, @jeline, @florae, @gentleshaid, @antigenx, @otemzi, @tezzmax. This is awesome. I know people that might be interested in this review task. @oracle-d, Reviewing Non-Steem Dapps inturn will going to bring more effective recognition to Steem Blockchain. Stay blessed team and keep up these Initiatives. Game game game.. Not a gammer but will try my best in the review. Here are the people who are good at game review @syedumair, @owner99, @donefezy, @khanza.aulia, & @otemzy. Good luck! These gaming enthusiasts might be interested: @thebumplunderer , @linnyplant, @jodipamungkas, @pacific-yt, @techmojo, @kalvas, @theriz, @sinzzer, @whack.science, @kivanov. Okay.. This is cool project. I'm in to be a reviewer. Guys, why you are not taking a part? Hey @otemzi @tfame3865 @smithmadu @josediccus @ibile y'all should come check this out.. I am sure @chimzycash @valency1 @ambmichael @ewuoso would be interested in this. This is great, am sure @ifeoluwa88, @xawi, @jesse12, @kristenantai01, @udezee and @rehan12 would be interested in this.. Totally a gamer 🎮 😄 here are my other top 5 gamers: @yandot @okoro @burlarj @davemccoy and @einstei1. Congratulations @oracle-d! Your post received a small up-vote from @wod-game as little gift. This is an extraordinary project, I have come to be a reviewer. my best friend, why don't you take part? I am sure @hafizullah @taylor10, @ikrahch, @chireerocks, @madushanka would be excited about this. This is Fantastic. I know people that might be interested in this review task. This is wonderful. I know individuals that may be keen on this audit assignment. I am certain @julietisrael @taylor10, @ikrahch, @chireerocks, @madushanka would be keen on this. I am certain @max1994, @mitchel55, @chireerocks, @madushanka would be amped up for this. This is cool project. I'm in to be a reviewer. Guys, why you are not taking a part? I am sure @borna, @ferrate, @kgbinternational, and @max1994 would be interested in this. I am certain @uche-nna @kristenantai01 @dimimp @jayce-ag @okipeter would be keen on this. Does it have to be in English? Is it not acceptable in Japanese? Hey @yasu24, for now, only English is accepted. I introduced @Oracle-D Review a Gaming DApp & Earn Rewards ft. State Of The DApps! #japanese the community. I introduced @Oracle-D Review a Gaming DApp & Earn Rewards ft. State Of The DApps! the #japanese community. Haahaa @jeanwandimi I know this is not our cup of coffee, but let us give it a go :-)) it might be fantastic. Good luck with your blog my dear. Thanks to partiko now I do get mentions. Thanks. I will be doing a review of this.